Moray Callum is the Executive Director of Ford Americas Design. In layman&apos;s terms, this means that if it got designed in the Western Hemisphere his stamp of approval is on it. 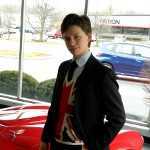 He oversaw the design of the 2010 Taurus and directed the teams in charge of the 2010 Mustang and the 2010 Fusion. We were lucky enough to have the chance to pick his brain a bit regarding the Evos concept from Frankfurt. Complex: The Evos concept is just that, a concept. How do you see it influencing Ford&apos;s road cars in coming years? Moray Callum: We&apos;re trying to signal where we&apos;re going in the future. While this isn&apos;t a car that will make it into production this is the imagery we will be using in global Ford cars. We want to emphasize that Fords are fun to drive. People should want to drive the car after looking at it. One important element is the front end. It&apos;s the same one seen on the Fiesta but it has been moved up higher on the car, making it a more of a focus to the front end. The lighting is another important aspect of the front. The head lamps and fog lights are another main feature of the car. People really rely on their lights when driving and we wanted to give the feeling of powerful lights. Look at the scale of the lights as well. Complex: It almost seems like the headlights on cars are looking more and more like eyes. BMW has their "angel eyes" and a lot of newer cars seem to have Spiderman&apos;s eyes. MC: That&apos;s a good point that they look like spider-man. I think people have always equated the head-lights with the eyes. New technologies have really let us be creative with the lighting. Lights used to all be the same shape, the same size, and looked bolted on. Now I think it&apos;s one of the places where we can be most creative with shape and texture because of all the technology there is to work with. Complex: One of the interesting points on the Evos is the kink where the tail lights are that gives the end of the roof-line an almost spoiler-like feel. MC: This is part of the silhouette design that we have been doing. We don&apos;t just want the car to be aerodynamic but we are trying to design for perceived efficiency.. The perception of good aerodynamics is important to us. This is where the teardrop shape comes from. Complex: Unlike a lot of cars, the Evos is actually interesting to look at from above as well. The glass makes that dumb-bell shape. Was this the result of the unorthodox doors or were they designed around the lines on the roof? MC: The roof was one of the first design elements. It creates an open and light feeling in the cockpit, but still gives the feeling of solidity to the roof and sides. Complex: It seems like there&apos;s almost a competition going regarding who can make the craziest doors. MC: We&apos;re trying to push the envelope of what is possible and people like it. People like to see the unusual doors on concepts cars. Complex: It is the only part of the exterior of the car that actually moves. This unexpected angle of movement does create a kind of drama. MC: Exactly. We want the Evos to look like a fun car, and the doors help with that with their drama.. We&apos;re always looking for engineering solutions for doors and making them interesting while remaining useful in the real world. In a pure concept car, on the other hand, we can experiment more. Complex: Would there be any chance of a similar grand tourer being released as a new personal luxury car? Perhaps even as a Lincoln Mk 9? MC: I&apos;m glad you asked that as Lincoln is very important us and we do have a lot of plans for the brand. I can&apos;t go into detail about exactly what we are planning though. Complex: The Evos is also a very sporty design. We&apos;ve heard that the next Mustang will be a much more modern design. Do you see the Evos relating to the next Mustang? MC: The next Mustang will be more modern but it will still primarily be a Mustang. While we are moving to a global design language the Mustang is so iconic that we don&apos;t want to move it away from its roots. Complex: Actually, one of the first Fords I thought of when I first saw the Evos was the Mustang Fastback. MC: We actually got a lot of comments likening this car to the Mustang. We&apos;re designing a Ford so the Mustang is surely on our minds. It must be a subliminal thing. Complex: Will there still be a live rear axle or will that be more modern as well? MC: I can&apos;t tell you that. Complex: The center console is made of several layers. It almost looks like airplane wings stacked on one another. What were your thoughts there? MC: No doubt you noticed that the driver&apos;s area is a different color from the rest of the car. We were really trying to focus on the car being fun to drive. That&apos;s why the driver&apos;s area is more colorful than the rest of the cockpit. The driver and the passengers have different roles in the car and the design reflects that. The different surfaces are angled towards different people within the car. Complex: There are also a lot of different textures on the inside of the Evos. With a lot of concepts there seems to be a very strong focus on a single interesting material. What are your thoughts there? MC: It&apos;s more like a production car in that regard. We were trying to create a useable interior and define each element. The different textures serve to break up the interior of the car. Each area is defined. Complex: The subtle curve and the dark fabric underneath the seats give them the illusion of levitation. Was this intentional? MC: Yes. We find that the customers really like this. It makes the interior look like it has lots of leg room. It doesn&apos;t look cramped. Complex: Thank you very much for your time. MC: It&apos;s been a pleasure.